Fully-automatic high-performance lines are being used increasingly in modern wood processing, even in raw wood cutting. An upstream scanner is an integral component of the overall system. The scanner records the relevant timber data on all sides in the blink of an eye (branches etc.) and supplies this to the downstream main machines, such as rip saws and optimizing cross-cut saws at full production speed. Without automatic recognition systems like this, the cutting performance of the overall systems would be unimaginable. This places the highest demands on the control technology. The WEINIG development departments provide solutions for highly automated production lines. We guarantee reliable production processes - for solid wood and softwood applications. WEINIG offers the right configuration for every application. 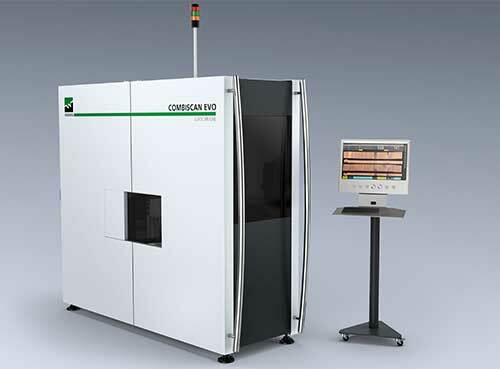 The CombiScan+ series sets completely new benchmarks in the development of scanner technology. The innovative, completely revised product portfolio offers generally higher performance and significant optimization of the traditional strengths of scanners. The CombiScan+ series provides solutions across all process stages: from ripping the timber and cross-cutting applications to a range of optimizing variants for use as a sorting scanner. The EasyScan series offers efficient performance features at attractive prices and is specially designed for the requirements of smaller companies with simple cross-cutting applications. It is capable of feeding a cross-cut saw and has the efficient and powerful optimization of the CombiScan+ series.